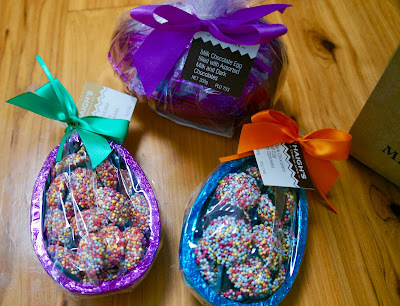 Sydney Shop Girl: Lovin' Life 29/3/2018: Easter Break!!!!!! 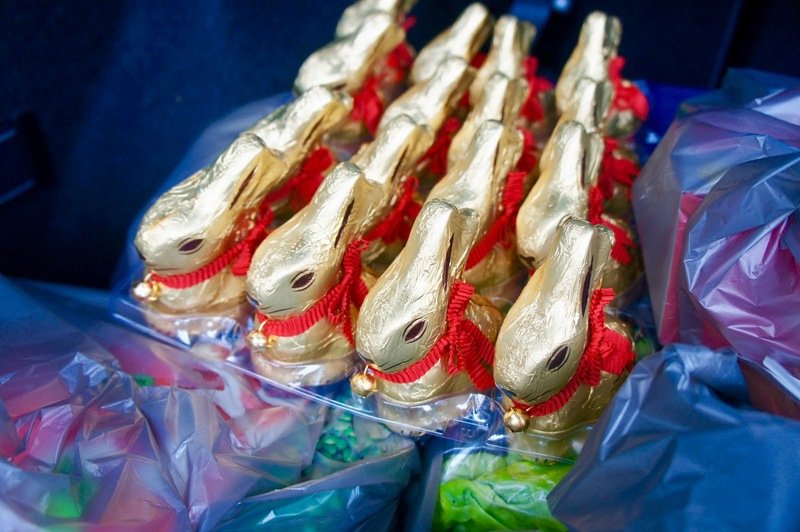 A tray (or should that be a jangle) of jingly, red bowed chocolate bunnies have been purchased ready to be given out after the last bell at school today. Grocery shopping armed with brunch from the Woolies sausage sizzle. The Easter feasting shopping has been done. Good Friday lunch will be at my place this year. The menu is going to be short and simple. Less fussing over the food will mean more time to relax into some special family time with a drink or two. Fruit salad as dessert after that sausage. The Hot Cross Buns have been purchased. I don't know what your Easter long weekend breakfasts look like but this is how mine does. On repeat for all four days. A new (to me) recipe this year is a ridiculously easy and addictive microwave chocolate fudge created by Bake, Play, Smile. The original version calls for Baileys but I used Kahlua for my first attempt. I'll be trying it again with Baileys too. All you need is a tin of condensed milk, 400g of dark chocolate, 70g butter and a 1/4 cup of Baileys / Kahlua. The liqueur is added after the other ingredients are melted together. My tip is is watch is carefully after the first two minutes of melting as I overcooked my first batch. Stir thoroughly after each burst in the microwave to ensure that the ingredients are evenly cooked. It makes a very dense and moreish fudge. When made with dark chocolate of a high cocoa percentage, the fudge sets more firmly but still needs refrigeration for storage. I'm getting the hang of baked cheesecakes. This is my latest effort before the pineapple upside down layer went over the top. I made it for an early Easter lunch at my besties and the leftovers have been serving me well for a sneaky weeknight dessert since then. This weekend's baking project requires some ripe pears. Hoping they'll keep in the fridge until tomorrow. The drink are chilling in the fridge as well. Ice cubes have been made and I've a supply of oranges on hand for that all important sliver of rind to drape across the ice in glasses of Chandon with Orange Bitters. The Haigh's run has been done. Except I forgot to get a supply of dark chocolate peppermint frogs for myself. Christmas and Easter are my favourite times of the year to visit Haigh's. There's an air of excitement and a sense of giving as customers browse the store for special gifts. I always think the samples you get at the counter are especially deserved after you've deliberated on the perfect gift for the people on your list. This year's giant Kinder eggs featured Hello Kitty and I think Star Wars. We only had Hello Kitty at my local Woolworths. I was very impressed with how cute the play set was. The detail and quality are pretty impressive for a $5 egg. Might pop back and get a couple for myself. Looking forwards, I'm eagerly anticipating lounging in bed over the next few mornings with a mug of tea and the last (!!) of the Chief Inspector Gamache novels I bought for my Kindle. What will I do when I finish them? We're going to the Easter Show on Saturday and hopefully our favourite swimming pool on Monday. In between, I'll be doing the housework languidly because I'll have four days over which to do it. And I'm sure I'll find some time to browse an online sales event or two. Be well and I'd like to wish you all a safe and happy Easter break. I think I want Easter at your place! All looks and sunds very yummy indeed :) Enjoy the break. Your breakfast is much like mine, starting tomorrow. Let the hot cross bun fest begin. It sounds like you have a wonderful Easter weekend ahead SSG! After last week's craziness I was looking forward to resting up, but both sides of the family have decided to do things on Easter Sunday so it will be a lot of running around. Hopefully Monday will be a bit quieter! Oh yum.... I'm reading this late on Good Friday afternoon so you'll have had your lunch. I'm sure it went well. I've just scoffed my first easter egg (a Red Tulip bunny!) far too quickly so am feeling a little ill. Or perhaps the champagne I'm also drinking. So well planned with lots of treats. Happy long weekend to you and yours!